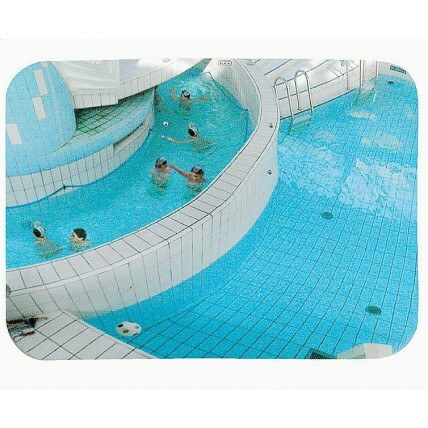 Convex mirrors provide a wider angle of view improving both safety and security in any location where a blindspot can either lead to accidents or where lack of clear surveillance increases theft or vandalism. 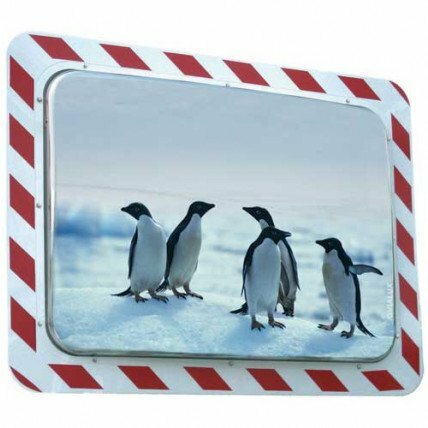 Safe Options has the extensive range of wide angle mirrors for use on roads, driveways, shops, hospitals and for industrial use in food processing, distribution and warehousing. 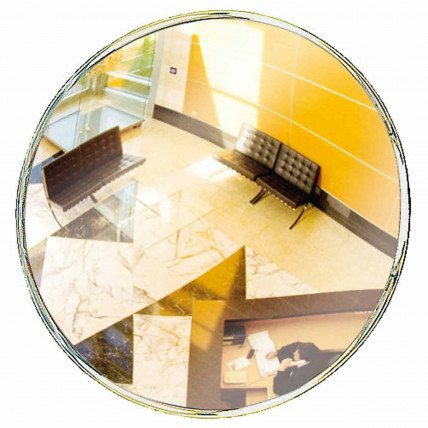 Furthermore we offer specialist anti-ligature mirrors for use in institutions and under vehicle inspection mirrors to aid security. 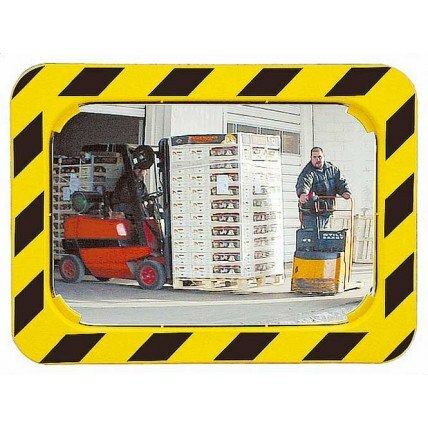 Portable security inspection mirrors are ideal for inspecting difficult to reach areas. 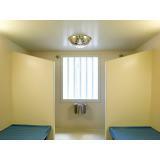 They are used to check for concealed explosives, weapons or drugs. 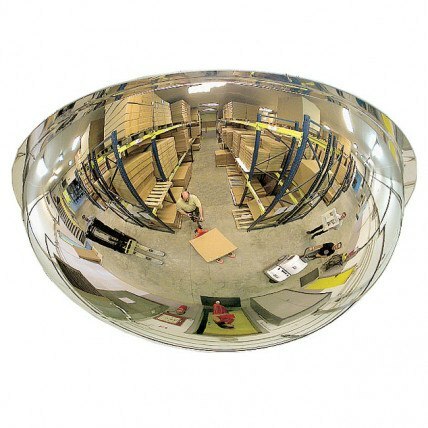 Convex mirrors are multi-faceted security devices that are functional in a range of businesses including warehouses, car dealerships and petrol stations. Learn where else they can be implemented. Convex Blind spot mirrors offer a wide angle of view and hugely decrease the chances of accident in and around your business premises, allowing drivers, pedestrians and cyclists to see around blind corners and walls, or to have a clearer view of other vehicles. Having looked at our range, you may want a bit more clarity on the subject. With this in mind, we've put together this article to answer some of our most frequently asked questions about mirrors. So read on to find out more. 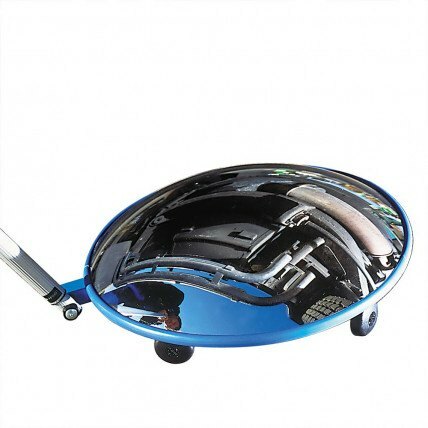 There are currently many types of blind spot mirrors available, each designed for a specific purpose, so it is worth familiarising yourself with our range. Exterior blind spot mirrors are constructed to weather the outside elements, whereas interior ones are suited for use in corridors and underground car parks. 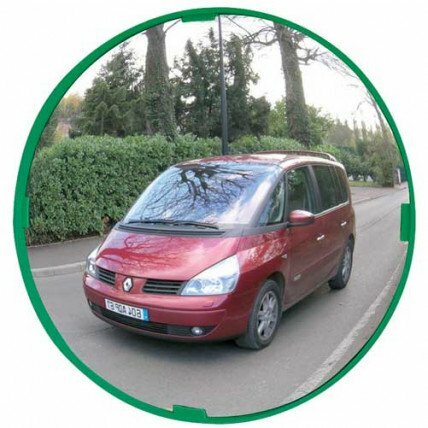 Cycle Mirrors are designed to help motorists see cyclists at junctions and turnings in car parks and on the roads. 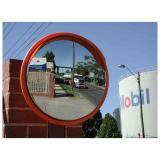 Mobile surveillance mirrors are designed for use by security services to see the undersides of cars and lorries. How can mirrors help us see around corners and over walls? By installing your mirror at a certain height and angle, its reflection will allow you to see what is happening behind or over the obstacle that is blocking your vision. The curved, reflective mirror surface makes objects appear smaller than they actually are, yet it gives you a wider field of vision than a flat surface. How do you fix an internal convex mirror to a wall? 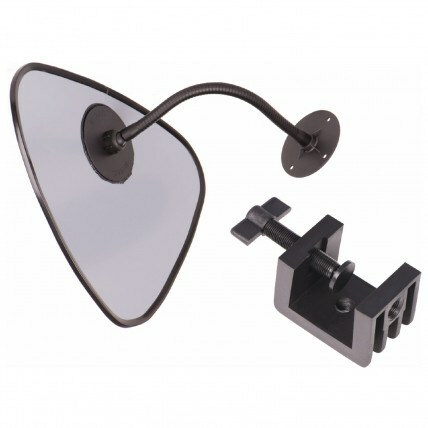 Our internal convex mirrors come with adjustable wall brackets which are very easy to install. First locate where you wish to install your mirror and mark out holes using the bracket as a template. Then drill four holes, insert rawl-plugs, place the bracket on the wall and screw in the screws. Mount the mirror on the bracket and ensure it is properly attached. Now it is installed on the wall, adjust the mirror until you have the correct view. How to choose the size of a blind spot mirror. 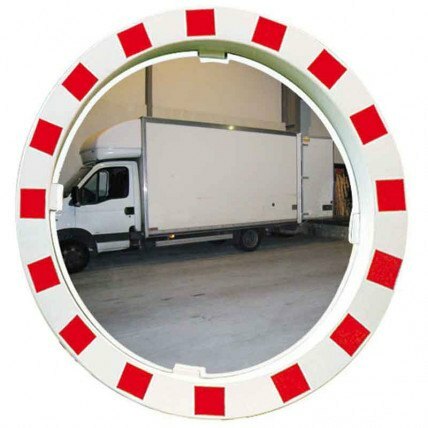 When choosing the size of a blind spot mirror, remember that the larger the mirror, the larger the image will be. A mirror that is too small will not provide adequate viewing visibility and distance. When determining the size of mirror required for your location, estimate by using the guide of one square foot of space to each inch of mirror. This should give you roughly the right size required.  What is a Trixi Mirror? 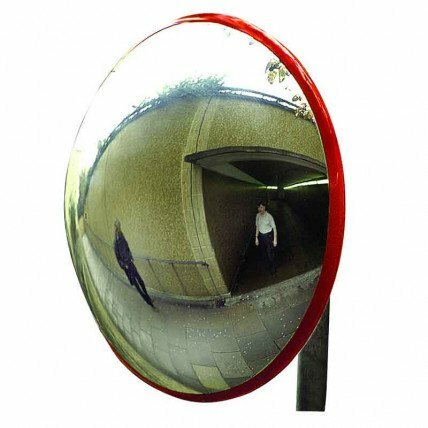 The Trixi Mirror is a large, curved mirror which is commonly positioned at the top of traffic lights. The mirror makes it easier for drivers (HGV drivers in particular) to see otherwise hidden cyclists who are approaching the junction from the left hand side.. This will reduce the chances of the rider being injured or killed due to being hit by vehicles as they turn left. If your question wasn't covered here, then get in contact with us. Phone us on 0800 567 7549 or email us and our experienced and knowledgeable staff will be on hand to answer your questions.